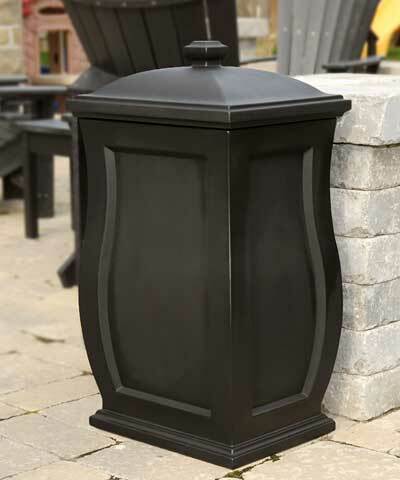 Create an organized look in your yard or garden with the Mayne Mansfield Storage Bin. The tall frame and fun curves on this unit form an exciting silhouette, while an inset design on each side adds an architectural hint. The pyramid-inspired, snap fit lid furthers the theme, and the black color looks beautiful in virtually any setting. The hollow body is perfect for holding bird seed, toys, garden equipment, or pool towels, and the molded polyethylene construction protects all contents from the elements. Two included hooks attach to the interior of this container, designed to hold a standard trash bag for camouflaging your refuse. For even more versatility, place your own 14" long, 10" wide, and 25" tall vessel inside the item. The flat base sits on a level surface easily, perfectly suited for use either in the home or outdoors. This remarkable item will remain sturdy and beautiful for several seasons, as will its black color. Keep your pool or garden supplies in a delightful container using this Mansfield Storage Bin. Made in the USA. Fifteen year limited warranty on bin, one year limited warranty on hooks.